Last night I was serenaded by two guitar players. I was minding my own business when Austin and Noah casually walked into my bedroom, guitars slung behind their backs. They unzipped their cases, took out their music and began to pick a few notes. It made me smile to see my boys concentrating so hard on producing song from wood and wire. Noah proudly showed me how he could play without looking at his music. Did I mention that they have only had one guitar lesson so far? And the fact that they were using this "practice" time as a means of procrastination? Not to mention being completely out of tune with each other? I'm cool with ALL of that. That gives them each one 30 minute lesson every week. While I thought it to be a worthy investment, it took a little convincing for David to jump on board. Tell me, does your child take music lessons? What kind? Piano, guitar, cow bell...? Am I getting a good deal or getting ripped off with that price? Enquiring minds want to know-- I want to know! Mine don't take lessons... but you know that. I have NO clue what a good rate is. I just want to say, they look completely natural holding those guitars. :) Love you! ben is doing dvd guitar lessons. when he finishes we'll do real lessons, which run abt $15 per 1/2 hour. we've also done drum lessons at anywhere from $10-20 per 1/2 hour. yeah, it's pricey... but it's worth it. We've never paid that much for piano lessons, but hey, you KNOW we are . . . frugal. David's stopped lessons for now, he was getting burned out and not enjoying them anymore. After moving as much as we have and being forced to find new teachers, I can say that a teacher makes all the difference. His favorite one of everyone he has had was a 16 year old homeschooler. My two older girls take piano, but we are fortunate to have a teacher that caters to homeschoolers. She charges us only $9 per child per 1/2 hour lesson. $18/week is $72 per month. She lives way out of town, so I pay more for gas, but her prices and teaching is worth it for us. I have friends that pay up to $125 per month of piano for one child. So it varies quite a lot. Ouoh. That would have seemed like sticker shock to me too, even though it probably costs the same here. We have done some art lessons that run about four weeks and they were about half that...I uh, think I will stick with those. I have no idea about prices... sorry! I responded on Facebook but I got charged WAY WAY WAY MORE for piano...and I didn't pay. The teacher I found wanted $60 per kid per half hour lesson. My friends pay anywhere from $10-20 but none of their teachers had availability. For speech therapy we pay $1300 per month! I feel like maybe I could get a degree in speech pathology for less money...I could be totally wrong but it pains me to pay that for learning to pronounce th, f, l's and r's. Still, I'd rather pay that than pay for piano lessons. wowza. I don't know how much they charge here... WAY less I'm sure, but then again it's REALLY hard to find anyone who KNOWS how to teach! Being a home educator, perhaps I'm over picky... though I hadn't ever considered cow bell before... there might be something to that! We pay 18$ a week for 30 minutes with an excellent piano TEACHER for 2 kids. We pay 15$ a week for 30 minutes with a brilliant violin teacher who comes to my house and is so patient with the 3rd child. I remember taking piano lessons with my brothers WAY back and I don't know how my mom paid for it, but we never enjoyed the practice. My kids don't like to start practice, but they usually enjoy it once they are half way done each day. And they get rewarded for their diligence. We are not paying for lessons, so I can't help you there. We have only paid for art lessons, and that was many moons ago. I read your post via email, and I just stopped by to tell you how much I love the photos of the boys serenading Mom. I read your blog regularly, but don't comment often. But I thought I'd chime in this time, cause I've been pricing guitar lessons for my teenage daughter, and I found a place nearby that charges $20 for 1/2 hour lessons. I thought I was getting totally ripped off but that sounds like a pretty fair price now that I've read these comments!! 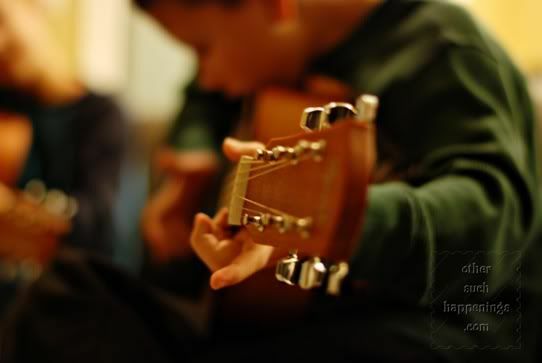 =) My daughter had been taking guitar at her old high school and when we moved, her new school doesn't offer it, so a year of guitar lessons will be her present when she turns 16 next week!! =) I'm sure it will be money well spent, esp. for individual lessons. And how fun that your boys can play together!! Guitar has been wonderful for my daughter... a good way to express herself as she gets through the grief over her father's passing. Hey Marsha... all three of ours take violin and their teacher charges $20/ half hour which is less than the going rate in our area. But if it makes you and hubs feel better about it... music lessons are about more than the actual music itself. Learning and struggling and persevering, diligence, discipline leading to success are some of the character lessons that are taught and the principles can be applied to other areas. One of the biggest things we've learned is that anything worth doing is worth doing poorly. By that I mean that... I wouldn't give a 3 yr a violin and expect him to play a concerto. The child starts out clumsy and off-key. The question isn't so much, "How well can he play?" at any given moment instead of asking, "Is progress being made?" It mirrors our walks with the Lord in that we think every failure is horrible and feel guilty but the Lord knows we are learning and growing and it takes PRACTICE... just like an instrument, but always the real question s/b "Is there growth? Am I learning?" I hope that helps with idea of seeing music lessons as an investment into their character as well as equipping them with a skill they can use to bless other people. Worship and music are very important biblically... It is helpful to have a teacher that understands that too. The other thing... when we learn to play in a group setting... as each person plays his part in a greater musical piece, it mirrors the body of Christ in that we don't have identical roles to play but each part is important to the success of the whole. My children are charged $20 a lesson. $80 in a 4 week month, $100 in a 5 week month. Learning music is something that will always stay with them and is a valuable investment in their future. Yep they do. Both of our children play an instrument and just started this fall. However, we get a screamin' deal because of where they go to school. It's only $10 per lesson per child. E (age almost 8 in just a few weeks) plays the drums and has been invited to play the bass drum on stage this June for graduation. B (age 6) plays keyboard and I'm told is progressing quickly for someone her age. They love it so much I couldn't imagine not doing it. But if we paid the same price per month you do we'd either have to re-think it or re-do our whole budget. If they enjoy it I'd say look around, you may find a better deal elsewhere, while still keeping them going until you find the better deal. But if they don't show interest a few weeks from now, I might suggest just dropping it. Not all kids love to play music, just like not all kids like to play sports. RaD, you are right that not all children love to play music. However, I would really suggest requiring a child to stick with lessons for at least one year. There is no way (other than special gifting) that a child or adult for that matter, could sufficiently master an instrument in a few weeks. It takes practice. Lots of practice. Even if they don't stick with the music they will learn lessons of perseverance which is "exercising" that particular muscle of our character and will benefit them in other areas. I'm not sure where your song post went so I am commenting here. I am not a music type of person, not auditory, couldn't tell you a song from a movie soundtrack when I walk out of the theater. I don't listen to music much at all. But every once in a while I will wake up with a song on my heart and sing it all day long. When that happens I know it is from the Lord. And i love it when it does happen. We have taken piano for 8 years now at 10$ per half hour. Three different teachers. I know I am getting a bargain..our current piano teacher is highly qualified and currently in medical school. I'm very grateful because I have three in piano, three in Taekwondo, two in basketball and one in voice. Sheesh we spend a lot on lessons. But one day it will pay off and they will support us in our old age=). all I have to say is; I have a fever and the only resolution is more cowbell! --then after that, my little is right around the age to start some kind of lesson. I'm thinking violin. But rather then play money, she could just follow along with her daddy. that would be cute enough right? I have wanted to start my kids with piano and guitar lessons. The cost is one of the things that has held me back. That does sound like a lot, but I wonder if it has anything to do w/your area. I agree w/Lainie, that they should be committed for a period of time. Back in the day when instruments were borrowed/loaned to students from the music department, my parents required me to play for at least one year before they bought me my first clarinet. My brand new red wood instrument was beautiful and I played for many, many years. That is pretty cool that they came and serenaded you. It is so great being a mommy. This is such a cute post! How blessed you are to have two up and coming musicians :) Yeah, that does seem a bit high for 30 minute lessons, but maybe your instructor is super qualified with lots of accomplishements? Thanks for stopping by my blog last week and have a blessed Sunday! Marsha, I feel your pain! Two of my girls take piano lessons. The lesson is 1/2 hour and costs $25 each! That's $200 a month for only 2 girls taking lessons! However, they love their teacher and are learning quickly so I guess that should count for something, right! Your boys look adorable, they'll be pros in no time flat! We were blessed to find a Christian lady in town that charges only 10 dollars a lesson. As for guitar...I am actually reviewing a worship guitar lessons DVD for a company, and might be giving away a copy shortly. So far we like it! My boys can play two chords after the first lesson. That is some serious sweetness right there! Oh my, Marsha ~ they are adorable. Music is a wonderful outlet for me personally. I use it to praise the Lord daily with my kids in song. :) I've also seen it build their confidence when they have to perform. It's a worthwhile investment! 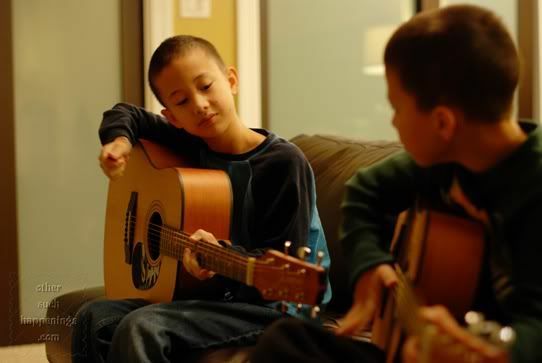 We started guitar with Little Buddy when he was about 5. He loved it but then was more interested in golf and then in baseball and then in golf again.. Get my drift? We weren't intentional about making him stick with it. Should I have? Anyway, luckily, this semester in co-op, he has music. Real, live music! Now they are learning notes and songs on the piano. We haven't had the kids take lessons---yet. Ashley got a pink guitar from the grandparents for Christmas and has always been facinated with guitars and flutes. The plan is to have her start taking lessons in the next year or so with Colton taking them when he's a little older. I'm curious now as to what to going rate is in my area for music lessons! We pay a dollar a minute. 40 min a week, so I vote no on the "aer we getting ripped off." You're getting a good deal. My boys are also taking guitar and have been for about 5 months. They're still beginners, and don't practice as much as they should. But I think it's good for them for that discipline. I took piano lessons, and wish I'd have done more. My three oldest kids take piano lessons from a retired school teacher who has played the piano for a gazillion years and taught lessons forever! She charges $7 per half-hour lesson, so it's $84/month for three kids! It's a great bargain! !